October of 2011 will make the record books as the best October since 1974. It was the best month period since 1987. It was so good that the major US indices are now back in positive territory. Just think, only a month ago we were flirting with bear market territory! Wow! What a difference one month will make! What a difference the PPT will make. The chart below is this wondrous month of October with 60-minute bars. Obviously the PPT started this rally, as they start all rallies, with the incredible 40-minute, 400-point Dow surge on October 4 as highlighted by the blue rectangle. Like almost all PPT rallies, this one burst forth in the final trading hour of the day. The rest of the month went as the Fed planned. Up, up, up. Yippee! During the month, many companies reported better earnings than analysts had predicted. The big banks boosted earnings largely from their debt issuance declining in value. Yes, that’s right. In the con game that is our stock market and economy banks are allowed to book declining debt values as earnings. Lowes is closing 20 stores and laying off 2,000. Walmart is dropping health care for new hires and raising premiums for the rest of their employees. Americans are still spending but the latest data indicates they are spending their paltry savings. Whirlpool said demand for their products were at ‘recessionary’ levels. Yet, the US propaganda mouthpieces did their job and reported that all was well. Never mind that Whirlpool makes durable goods but those orders increased. Of course, we had to back out transport and auto production to get a positive number but that’s how the game is played. Third quarter GDP was estimated to be 2.5%. New claims for unemployment benefits was just a paltry 400,000. Everything is peachy. The big news of the month was of course the solution to the Greek debt crisis announced on Thursday, October 27. The solution of course was to create a fund of some $1.4 trillion dollars with which to issue new debt. Where would the $1.4 trillion come from, the media asked. They are all so stupid. We know where it will come from. Bend over people. The banks need another bailout. Anyway, that news was good for a 330-point Dow rally. The month of October was fantastic. Happy days are here again. The stock market is celebrating. Investors are once again saved by central bank intervention. What could be better? Freedom? Capitalism? Dignity? Nah. We can’t operate under capitalism. Big banks would surely fail. 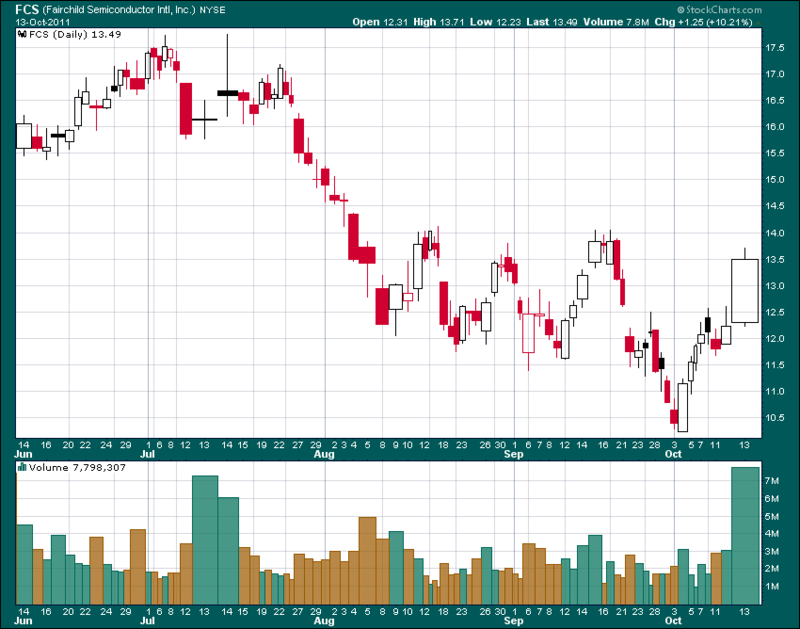 Besides, central bank intervention and manipulation draw such pretty charts. Behold for posterity the wondrous month of October. Oh, don’t forget to send Bernanke a ‘Thank You’ card! I am sure that everyone is sick of hearing about the lackluster economy. Unemployment is high, Europe is choking on a debt crisis, and populace demonstrations are popping up all over the globe. But investors only care about one thing - the stock market. They are willing to surrender everything - capitalism, dignity, truth, liberty, autonomy - in exchange for a stock market rally. Luckily, a stock rally is easy to conjure. 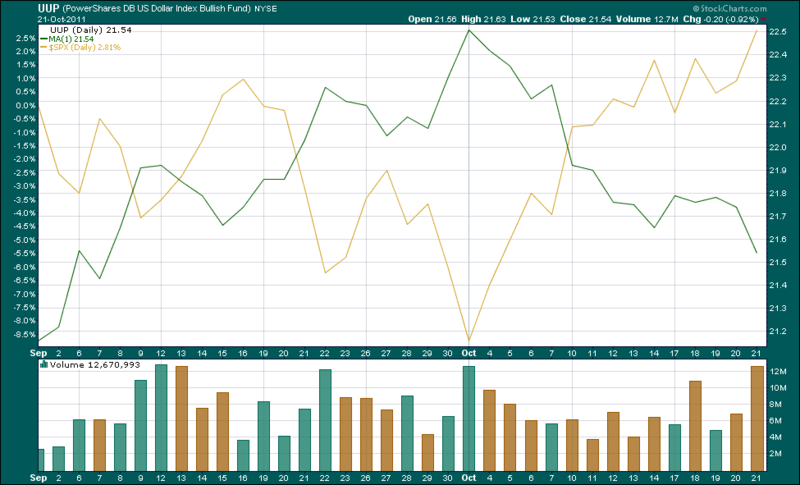 The chart below shows the S&P 500 in gold and the US dollar ETF, the UUP, in green for the past seven weeks. While the Federal Reserve is completely inept in almost everything they do, they are very skillful in one area. They can always stoke a rally in stocks. The problem is that the economy and reality do not necessarily warrant a market rally. The solution is simple. Kill the US currency valuation and inflate the stock market with all other commodities. 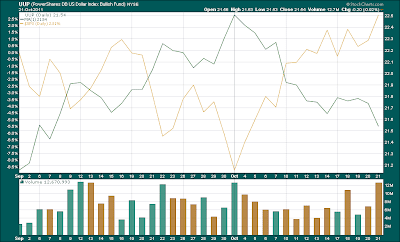 Inversely, allow the dollar valuation to rise and stocks take a terrible beating. The chart below starts with the month of September. The dollar rose and stocks fell. The September plunge of some 8% in the S&P 500 index obviously scared the bejeepers out of the Fed who met the second trading day of October with a blizzard of buying. More accurately, the Plunge Protection Team (PPT) hit the markets at exactly 3:15 PM with a 45-minute barrage of buying that lifted the Dow some 400 points at the end of the day. The ‘bottom’ was in. No further market deterioration would be allowed. Just like that, a rally ensued. How did they do it? Simple. They killed the dollar. It works every time. Agent Geithner even dashed over to Europe to implore the European central bankers to resolve the Greek debt fiasco as the American central bank had three years ago resolved their own little brush with insolvency. Print money fellows! Create balance sheet credits! Buy up the garbage debt that no one on the planet wants to own! Steal the money from the citizens! Heck, they will never know as long as the stock market rises. That’s all they care about. And please, hurry up and write the check. We need a stock market rally in the US. And they will. Is there anybody in the entire solar system that doesn’t think the ECB will write a multi-trillion dollar check to backstop the French, German, and US banks that are on the hook for the Greek debt and related derivatives? Come on, fellows. We all know you are bank agents masquerading as benevolent federal monetary guardians who are kind enough to ensure flexibility of monetary supply. Banks can’t fail due to their derivative holdings. We know that. Write the check. Interestingly, when the Greek debt crises first surfaced over a year ago, the central banks insisted that $20 billion would solve the problem. Then it went to $40 billion. $80 billion tops. Maybe $120 billion would eventually be needed. Actually $220 billion but no more. That would clean everything up - okay $440 billion but that would cover any future Italian or Spanish debt problems. Now, the figure is $2 trillion. And that’s probably not enough. Does anybody have a clue about the damage of derivatives when they blow up? Obviously not. So why does the ECB need to hurry up and write a $2 trillion dollar check? The result would no doubt be a stronger euro, a weaker dollar, and a stock rally that should put a smile of everyone’s face! The chart below is no doubt reflecting the Fed’s hard work of devaluing the US dollar coupled with the anticipation of Europe surrendering to the central banker mendacious threat of ‘too big to fail banks’ bringing on armageddon. While the anticipation builds for Europe’s next banker bailout, the Fed in the US is engaged in the process of manipulating the interest rates lower by selling short-term Treasuries and buying longer-term Treasuries. They do this through their long established practice known as Permanent Open Market Operations (POMO). It is safe to assume that the Fed is also busy buying call options at the same time to produce more of a stock rally than a simple debt instrument offset would produce. The POMO days are generally powerful days for the stock market. 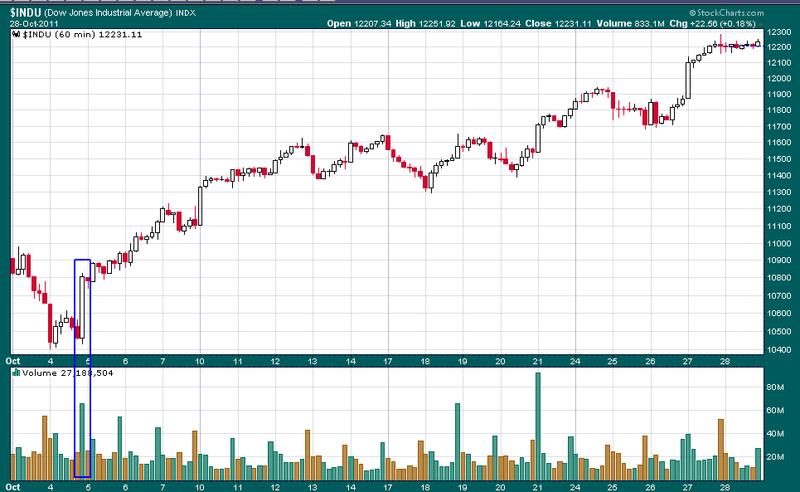 Today (Friday) was a POMO day and the Dow rose 200 points. Yesterday (Thursday) was not a POMO day and the Dow rose just 37 points. The month of October has 21 trading days. 11 of them are POMO days. October will be a positive month for investors. Ain’t they smart? The market isn’t rocket science. Intelligence is an unnecessary burden in the investing process. 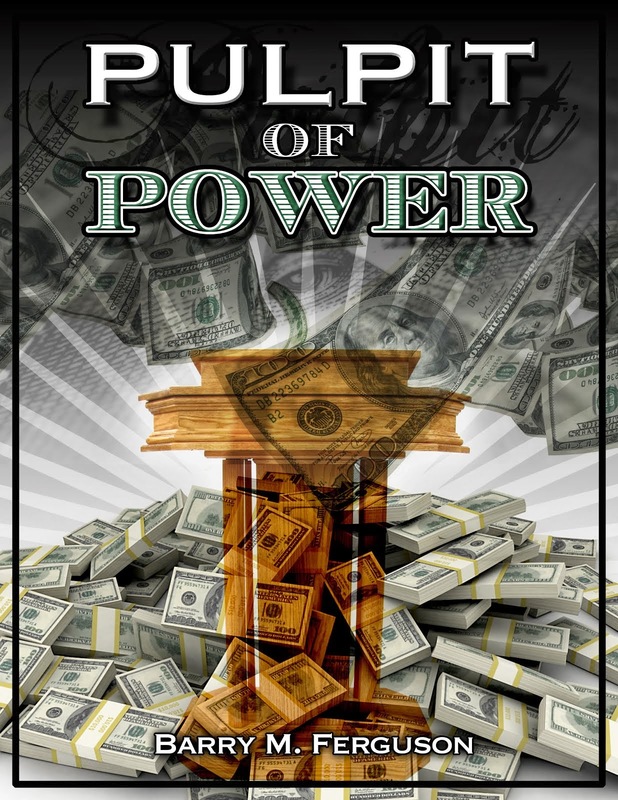 The PPT and the Fed will make all things rise and the POMO days are the strongest. The simple solution to a rising stock market is a devaluing dollar. Just wait until the ECB exerts an even stronger stranglehold around the neck of the poor souls in Europe with a $2 trillion dollar check. US markets will no doubt shoot higher. Inflation. Learn to love it! Ignorance is not knowing. Mania is believing the herd. The stock market turned on the drop of a bear. That is, commentators and pundits simply had to voice the realization that stocks were knocking on the door of a bear market at the end of September. By definition, the bear market is a drop in an index of 20% from its most recent high. As if Ben Bernanke’s Batman alarm went off, the indices burst higher from the cave of the bear market on the second trading day of October with a classic PPT rally of 400 Dow points in the final 40 minutes of the trading day. It hasn’t looked back. Two weeks later, the Dow is nearly even for the year. And to think - all we had to do was mention the word, ‘bear’! What changed? Yes the PPT clearly decided that a bear market would not be tolerated. But the driving force of the bear market was, and is, too much debt. Has the debt problem been solved? Yes, like always, the banks that extended loans that cannot be repaid will be ‘re-capitalized’ by the central banks. Where do they get the money? Thin air? No, from the tax payers either through monetary inflation or sovereign debt expansion. Presto! Problem solved. Greece is healthy again and the Gulf of Mexico is free from petroleum pollution. Corporations are suddenly gold nuggets again as the debt problems vanish. Actually the debt problems vanish because the central banks are acting so that the derivative world stays healthy. Derivatives are on every balance sheet and contribute to perceived capital and earnings. That’s the real reason debt cannot be defaulted. That’s the real reason Greece will not be allowed to exit the EU. All the while, investors remain ignorant of the precariousness of the world economic environment. Fortunately, the ignorant can survive because the central banks reward ignorance. As long as investors don’t know anything and don’t read articles like this, they can merrily invest their money and be confident that the central bank stands ready to intervene at the drop of a bear. No worries. Just stay ignorant. That’s the key. That ignorance of course leads to mania. Surely the herd is right. Well, of course they are. As evidence, we can look at the mania in the semiconductor world. Specifically, PPT rallies lift all boats and semis are on the crest of the PPT tsunami of buying. Virtually every company in the business has reported weakness of late. Let’s look at Fairchild Semi. They make chips for the communications industry. Reported in business publications on October 14, 2011, the company said Q3 profit fell 19% versus last year and sales were lower by 3%. True, the earnings beat analyst expectations by two cents. Read on. Sales were below estimates. The company also (like most of its rivals) guided sales estimates lower than analysts’ guesses saying that the economy had slowed. The company plans to ship fewer chips going forward. So? What does falling sales and falling earnings and a weakening economy and falling prospects have to do with anything? In a PPT driven market mania, the answer is nothing. Absolutely nothing. Nada. Zip. This is PPT mania. It’s all good. Get you some. Just close your eyes and buy. You don’t have to know anything. Fairchild was up 10% on the news. No, that’s not a misprint. The stock was up 10% on the wonderful news. Where will the mania end? Don’t ask me. Ask Ben. Below is one of the better performing stocks of the ebullient day of October 13. I include this chart because it is representative of the investment environment. All the roulette players think they have acquired some kind of skill by always betting on black only they don’t realize that the Fed has painted all the numbers black. Tomorrow we will spin the wheel again. I’ll bet the little ball lands on a black number. Notice in the chart below that the stock price has been in decline to reflect reality. Notice also the explosion in volume on the ebullient news of an eroding environment and dimming prospects. Does anybody care about reality anymore? I doubt it. I’m not trying to pick on Fairchild. I just thought the chart was worth pointing out a little perspective to a completely irrational stock rally.